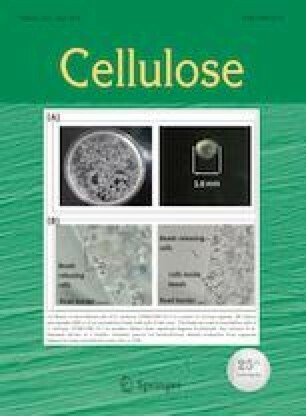 In this study, the effects of replacing a hydroxyl group on C-6 of cellulose by a phosphate group, as in cellulose-6-phosphate, on the aldehyde content and the reactivity of dialdehyde cellulose phosphate were explored. Cellulose-6-phosphate (1) was efficiently oxidized by using an aqueous solution of potassium periodate to obtain dialdehyde cellulose phosphate (DACP) (2). The condensation of DACP with two aromatic amines, sulfanilamide (3) and sulfathiazole (4) produced the respective Schiff bases, namely (cellulose-6-phoshate-2,3-bis-[(4-methylene-amino)-benzene-sulfonamide] (5) and cellulose-6-phoshate-2,3-bis-[(4-methylene-amino)-N-(thiazol-2-yl) benzene sulfonamide] (6). Fourier transform infrared spectra, scanning electron microscope (SEM), X-ray diffraction (XRD), and thermal gravimetric analysis (TGA) were used to characterize the synthesized biopolymers. For compounds 2, 5, and 6, the aldehyde content of was found to be 95%, 20.1%, and 11.2%, respectively. The highest reactivity of DACP toward sulfa drugs was displayed due to aldehyde content values. Significant changes in the d-spacing with decreasing crystallinity index (46.9%) were observed in the XRD of cellulose-6-phosphate and its Schiff’s base. In SEM images, a fibrous structure and a rough surface were observed in the samples with slight variations. The results of TGA showed a delay in the major degradation step for DACP, cellulose-6-phosphate-2,3-bis[(4-methyleneamino)-N-(thiazol-2-yl)-benzen sulfonamide] and cellulose-6-phosphate-2,3-bis-[(4-methyleneamino)-benzene sulfonamide] compared to cellulose phosphate. The authors extend their appreciation to the Deanship of Scientific Research at King Khalid University for funding this work through research groups program under Grant No. R.G.P. 1/19/38.